Within the cell nucleus, in the nucleoli, ribosomal RNAs are synthesized and participate in several biological processes. To better understand nucleoli‐related processes, their visualization is often required, for which specific markers are needed. Herein, we report the design of novel fluorescent organotin compounds derived from 4‐hydroxy‐N′‐((2‐hydroxynaphthalen‐1‐yl)methylene)benzohydrazide and their cytoplasm and nucleoli staining of B16F10 cells in vitro. Tin compounds bearing an aliphatic carbon chain (‐C12H25) and an electron‐donating group (‐OH) were prepared, and the latter could be derivatized to bear the boron cluster anions [B12H12]2− and [3,3′‐Co(1,2‐C2B9H11)2]−(COSAN). All of the conjugates have been fully characterized and their luminescence properties have been assessed. In general, they show good quantum yields in solution (24–49 %), those for the COSAN derivatives being lower. Remarkably, the linking of [B12H12]2− and COSAN to the complexes made them more soluble, without being detrimental to their luminescence properties. Living B16F10 cells were treated with all of the compounds to determine their fluorescence staining properties; the compounds bearing the aliphatic chain showed a reduced staining capacity due to the formation of aggregates. Notably, the complexes bearing different boron clusters showed different staining effects; those bearing [B12H12]2− showed extraordinary staining of the nucleoli and cytoplasm, whereas those bearing COSAN were only detected in the cytoplasm. 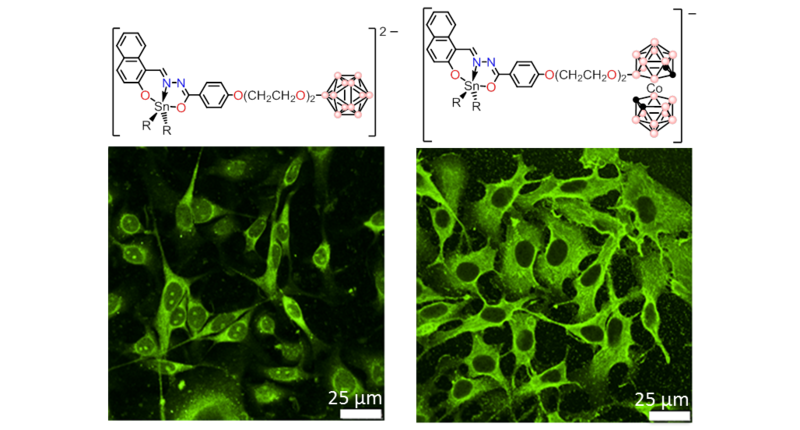 The remarkable fluorescence staining properties shown by these organotin compounds make them excellent candidates for fluorescence bioimaging in vitro.